THREE YEARS LATER: After Nanda Prasad Adhikari's death, his widow, Ganga Maya, is battling for justice on her own. Nanda Prasad Adhikari’s frozen body has been lying for three years inside the morgue at Tribhuvan University Teaching Hospital in Kathmandu. Nanda Prasad died on 22 September 2014, after 333 days of hunger striking, during which he was force-fed intravenously. His widow, Ganga Maya, has been on and off her own hunger strike at Bir Hospital in Kathmandu for five years. She is mostly alone, accompanied only by photos of her dead husband and son. This week, as activists mark the third anniversary of Nanda Prasad’s demise, his yet-to-be-cremated body serves as a stark reminder that Nepal’s transitional justice process is also dead. The men accused of murdering his 18-year-old son, Krishna Prasad, in 2004 enjoy political protection. The Supreme Court has ordered police to put Chhabi Lal Poudel, the main accused, in judicial custody until the final verdict, but he continues to walk free. Last month, when Maoist Chair Pushpa Kamal Dahal’s daughter Renu Dahal was elected mayor of Bharatpur after re-polling, Poudel and his family members went to congratulate her (pictured above). In Chitwan, where Krishna Prasad was abducted, tortured and killed allegedly by the Maoists, there is still so much fear that no one dares testify against the accused. Nanda Prasad's older son, Noor Prasad, has gone into hiding after being threatened by Maoists. 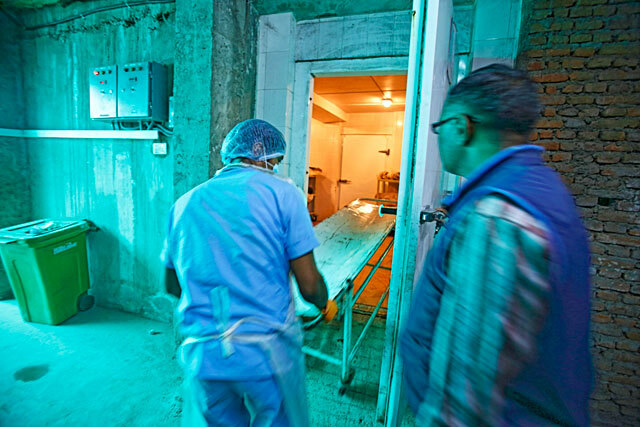 The morgue at TUTH where Adhikari's frozen body has been kept for three years. The district court is headed by Judge Kabi Prasad Neupane, who was appointed chief election officer for the local elections in Bharatpur. His famously contradictory statements in June allowed the Election Commission to conduct re-polling that resulted in Renu Dahal’s win. Giri and his team of lawyers are now trying to transfer this sub-judice case to the Lalitpur High Court under a new federal law. 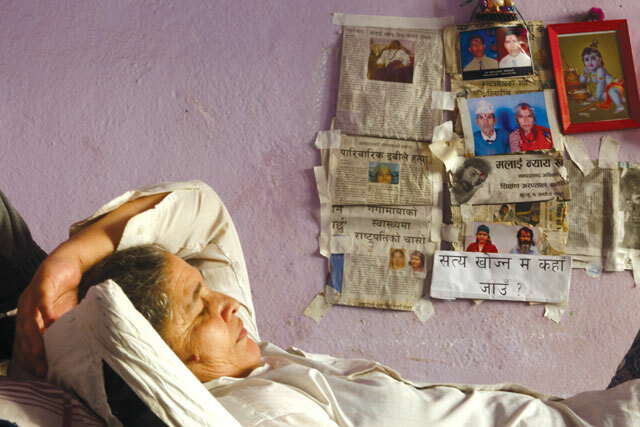 As the legal battle drags on, Nanda Prasad’s body is slowly decomposing. The temperature inside the morgue (0-4C) preserves bodies for only a few months, not for years on end. He died in the same hospital at age 52 after refusing intravenous nutrients and medicines. A few months previously, the Chitwan District Court had released everyone accused of murdering Krishna Prasad. That legal setback further hardened Nanda Prasad’s resolve: he rejected then-Home Minister Bam Dev Gautam’s request to end the fast. Some newspapers manipulated Nanda Prasad’s outburst, insinuating that he was only after money, not justice. The distorted coverage deeply saddened him, and he chose to die rather than compromise on justice. Ganga Maya refused to perform her husband’s final rites. Since his death, she has been fighting on her own against the Maoists who are now in the coalition government. In their home village of Phujel of Gorkha district, the Adhikaris were feuding with Chhabi Lal Poudel, who headed a kangaroo court run by the Maoists. After the death of one of Adhikari's brothers, Poudel ordered Adhikari to transfer a share of his property to the brother’s widow. He refused, so the Maoists cut off his water supply. They also warned local shopkeepers not to sell anything to him or his family. Nanda Prasad fought with everyone who supported the Maoist diktat. Nanda Prasad’s stubborn uprightness led to animosity, not just with the Maoists but also his neighbours. When locals needed to erect electricity poles on part of his property, he refused. In this photo shared on Facebook, Chhabi Lal Poudel, the main accused in the murder of Adhikari's son, poses with Bharatpur's newly-elected mayor Renu Dahal (second from left). It was against this backdrop that his son was killed in June 2004. There is circumstantial evidence of Maoist involvement in the murder. Poudel, the main accused, had enquired about the whereabouts of Adhikari’s son, and learned he was in Chitwan. Poudel’s son Parshu Ram, who was also close to the Maoists, was living in Chitwan at the time. Krishna Prasad, then 18, was caught, tortured and killed after being dragged through the streets in a sack behind a motorcycle. Police were not willing to register a first information report (FIR). After the war, when the Adhikari couple came to Kathmandu seeking justice, they were detained by the Baburam Bhattarai government. When Nanda Prasad and Ganga Maya staged a sit-in at Baluwatar, the Khil Raj Regmi government sent him to a mental asylum. Bhattarai, who himself ran parallel governments and kangaroo courts across the country during the insurgency, has always defended the accused, referring to Krishna Prasad’s murder as a war-era case that should be probed by the Truth and Reconciliation Commission (TRC). “Bhattarai is defending those who conspired to kill the Adhikari couple’s son because he is not just morally but also legally guilty of this crime and all murders committed under his so-called parallel government,” says human rights activist Subodh Raj Pyakurel.